She has raised the necessary capital to take this toy into production through a funding platform called Kickstarter http://www.kickstarter.com/, which since its launch in 2009 has funded over 30,000 creative projects. Her highly successful pitch? “Our girls need Goldie“. And the great marketing videos starring her “development team” (average age about 5) show that she is just the type of role model a modern girl needs, and really understands her target market. The first of a series of GoldieBlox sets is currently in the pipeline, with several others now lined up to follow. Debbie is the creative force behind GoldieBlox. She studied engineering at Stanford (Product Design, ’05) and has made it her mission in life to tackle the gender gap in science, technology, engineering and math. Debbie writes and illustrates Goldie’s stories, taking inspiration from her grandmother, one of the first female cartoonists and creator of “Mr. Magoo”. Prior to founding GoldieBlox, Debbie served as the Marketing Director of Lori Bonn, a national jewelry company. There, she learned the ins and outs of bringing a product to market: from overseas manufacturing to sales/marketing to product fulfillment. For the past 7 years, Debbie has also served as a brand strategy consultant for a wide variety of organizations including Microsoft, T-Mobile, Organic Valley and the New York Knicks. She gets the power of branding, every step of the way. Debbie got her first taste of social impact work in 2008, when she spent 6 months volunteering at a grassroots nonprofit in rural India. This experience helped pave the way to finding her true passion: inspiring the next generation of female engineers. Toy dealers here in Germany should sit up and notice. Germany prides itself as the land of engineers and toy design, but not since Playmobil in the 70s has anyone come up with anything with this kind of potential. And even Playmobil doesn’t require much in the way of building skills or imagination. Lego is still the king of building tools, but most of their toys relating to engineering seem to be made for boys. There is nothing really creative in their current product line to excite a girl. GoldieBlox should be great for children, boys or girls, who want to learn English. The combination of listening to a story being read out and then being able to work hands-on is ideal. I’ve ordered a few sets, but of course ordering individual sets is not economical. Teacher colleague Gabrielle Jones has just started up a blog and shared a lesson on Social Commerce. I’m considering using the GoldieBlox story in the Business English book I’m working on for Cornelsen, but don’t know whether the creative start-up angle is relevant for the Deutsche Mittelstand we’re producing the book for. GoldieBlox is a play on words, Goldie Locks being the main character in the English fairytale, The Story of the Three Bears, which is relatively unknown in Germany. It’s Thanksgiving? Forget turkey. Bacon is better. Bacon? Have a closer look. 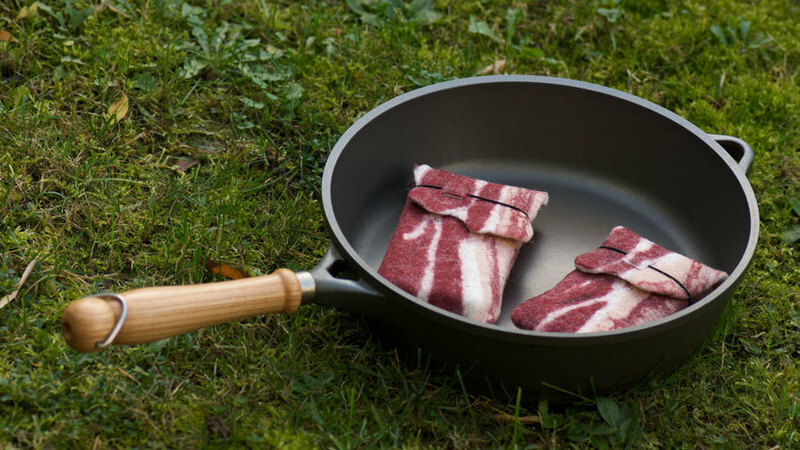 Dolce tipped me off to The iPhone Bacon Case. It’s hand-felted in one piece and is available on dawanda.de, a site that lets artisans sell their handiwork as presents. Handmade, homespun, unique, precious, affordable, marvellous, well-designed. Maybe the Bacon Case is no longer available, after this amazing viral marketing story. I’d like one, too. But first we need to bring home the bacon to earn the phone.